No one knows how long he was waiting for someone to notice him. 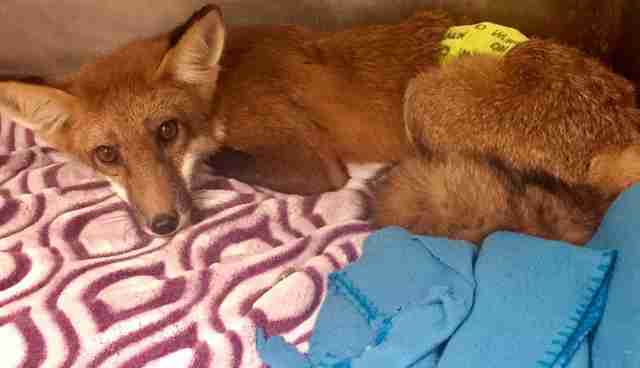 One lucky fox was recently in a bad situation that had the potential to get much worse. Thankfully, a little kindness managed to go a long way. This week, a red bundle was spotted by a Good Samaritan on a major expressway in Chicago. It was a red fox, who had been hit by a car and took shelter by the center median of the highway. But he was in serious danger of getting hit again if he wasn't moved immediately. The Good Samaritan jumped into action and called the Chicago Police Department, who arrived with animal control minutes before a volunteer from Flint Creek Wildlife Rehabilitation did, according to Dawn Keller, director and founder of the rehabilitation center. 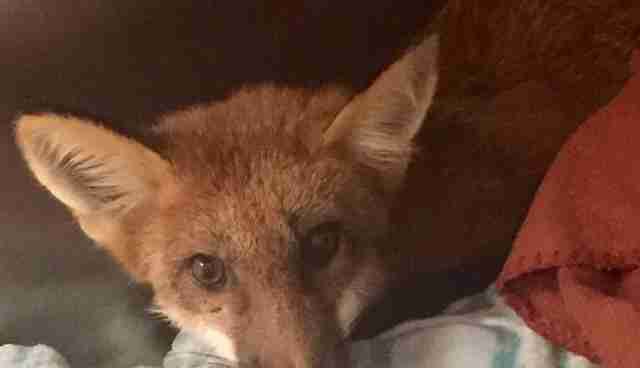 After tranquilizing the fox so he wouldn't escape into traffic - though he was injured, he was still mobile - rescuers were finally able to save the frightened animal. 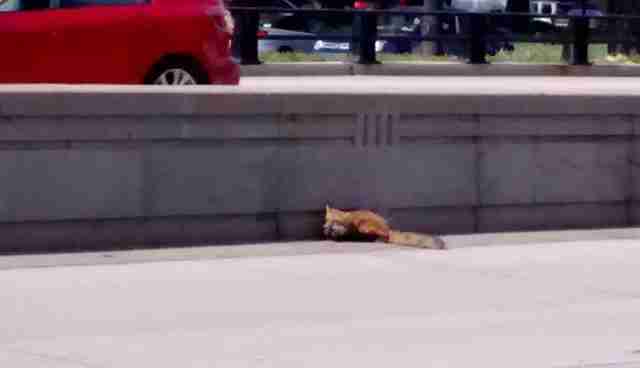 "We are unsure of how long the fox was stranded in the center median, but we believe that the entire incident downtown lasted about one hour," Keller told The Dodo. "He was scared - just as wildlife always is when in close proximity to humans." 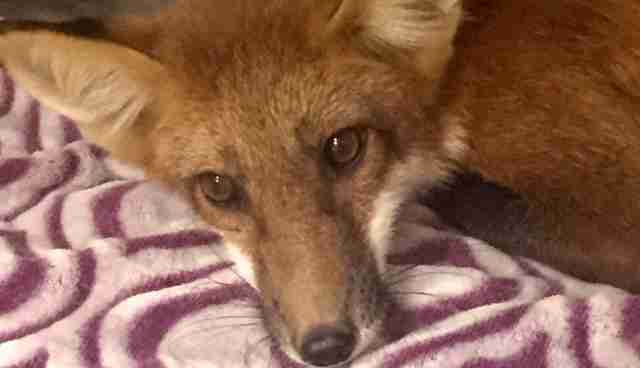 An examination showed that while the fox had no broken bones, there was some blood in his urine, a possible indication of internal injuries - and so he will be kept under observation for further evaluation. He's currently recovering at Flint Creek Wildlife's Barrington, Illinois, facility. Wild animals getting struck and killed by vehicles is sadly a common occurrence in the U.S. While the numbers are difficult to measure, it's estimated that more than a million animals are hit on U.S. roads each week. Fortunately, there are still efforts that can be taken to prevent an accident from occurring, such as driving slowly, especially during dusk and dawn. If you do hit an animal, contact a wildlife rescue or other animal care resource - there might still be time to save a life. And, as this rescue shows, just taking the time to stop and call the experts can make a world of difference. 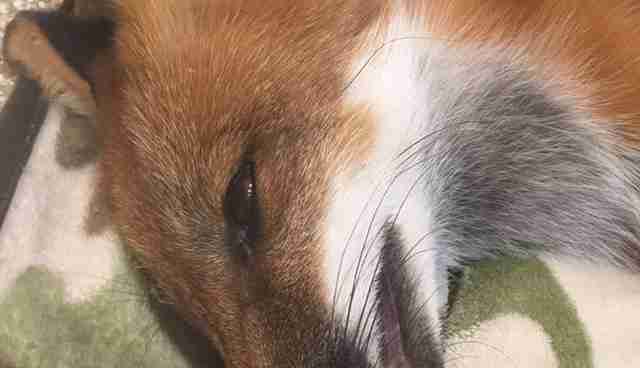 On Thursday, the rescue shared a photo on Facebook update of the fox to alert and well - barring any internal injuries, the fox is expected to make a full recovery and return to the wild sometime soon. "He is looking really good now," Keller said. "No more blood in the urine and [he's] eating well." To help Flint Creek Wildlife care for this fox as he recovers, and rescue more animals like him, you can make a donation here.